A letter requesting a Part II Order was sent to the Minister of Environment & Climate Change and copied to the City of Toronto in March 2018. On March 26, 2019, the Minister of the Environment, Conservation and Parks approved the Waterfront Sanitary Servicing Master Plan – 2017 Update Environmental Assessment (EA) study. The next and final phase of this project will include detailed design followed by construction. In 2012, the City of Toronto completed the Waterfront Sanitary Servicing Master Plan Class Environmental Assessment (EA) Study, which recommended a strategy to provide sanitary servicing for development along the City’s waterfront to 2031. Strong development growth in the study area since 2012 necessitated a review of the recommended sanitary servicing strategy in the 2012 WSSMP. The WSSMP 2017 Update has been completed following Approach 2 of the Master Planning process as set out in the Municipal Class EA document (amended in 2007, 2011 and 2015). The EA study process involved revisiting the problem/opportunity (based on updated population projections and sanitary servicing needs, and taking into consideration infrastructure projects and other changes in the study area since 2012), developing and evaluating new servicing alternatives, and recommending a preferred sanitary servicing strategy to meet current and future needs in the study area to 2041. Upgrade of a sanitary sewer along Lower Jarvis Street under the Gardiner Expressway. A new sewage pumping station at 545 Commissioners Street with new forcemains along Commissioners Street and Carlaw Avenue (Schedule B). The WSSMP 2017 Update Report has been placed on public record for a 30-day public review period starting February 15, 2018 and ended on March 17, 2018. The City of Toronto’s waterfront has experienced strong development growth in recent years. Growth in the waterfront is expected to intensify in both the short- and long-term. A comprehensive Sanitary Servicing Master Plan is required to ensure that the necessary sanitary sewer infrastructure is in place to effectively service this growth. The City is undertaking a Municipal Class Environmental Assessment to develop this Master Plan. 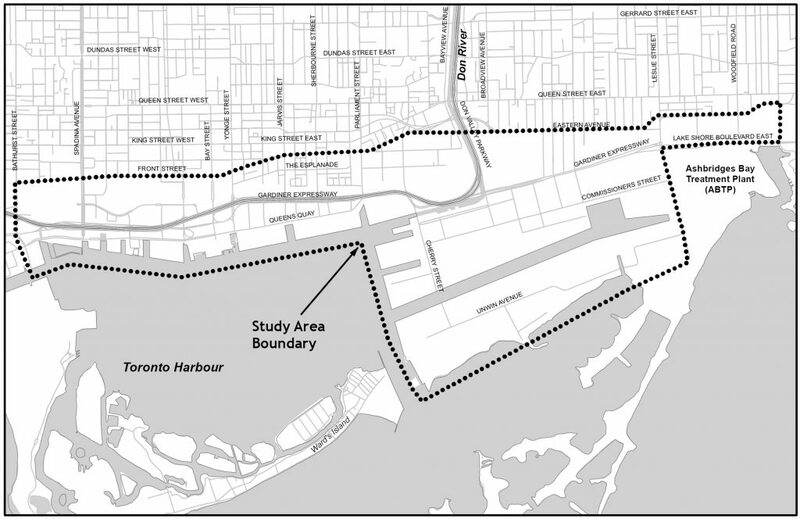 The study area for this study is shown below and is bounded by Bathurst Street, Front Street/Eastern Avenue, Coxwell Avenue and Lake Ontario. This study area encompasses several large development parcels including East Bayfront, West Don Lands, Lower Don Lands, and the Portlands. Many other smaller developments are also proposed such as individual commercial complexes, office towers, and condominiums. The study area is serviced by three very large sanitary sewers, known as “interceptors.” Wastewater collected by these three interceptors flows to the Ashbridges Bay Treatment Plant where it is treated and released into Lake Ontario. There are also three pumping stations in the study area, which aid in the flow of wastewater to the treatment plant. The Master Plan will ensure that wastewater from existing and future development in this area will be properly conveyed to the treatment plant.